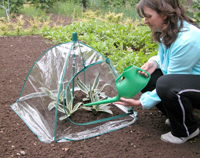 Umbrella Cloche Instant Plant Protection in seconds. Manufactured using strong-coated steel. 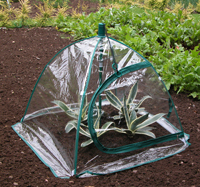 Clear PVC - UV Stabilised Cover. Ideal for bringing on plants in the early season and perfect for giving your hanging baskets a head start, there is room enough for 2 x 14" Baskets and other plants for boarders etc, Zip Door for ventilation and easy access. Compact to store' when not in use.